This week, we bring you a travel guide to one of our favourite parts of the world: South Africa. Whether you’re a couple, a family, or a backpacker, South Africa guarantees to meet and exceed all expectations with its colourful culture, landscape and wildlife. Situated on the southernmost tip of the African continent, it’s hard to find natural beauty that surpasses South Africa’s. If you’re planning a trip or looking for some summer holiday inspiration, this could be just the article for you. 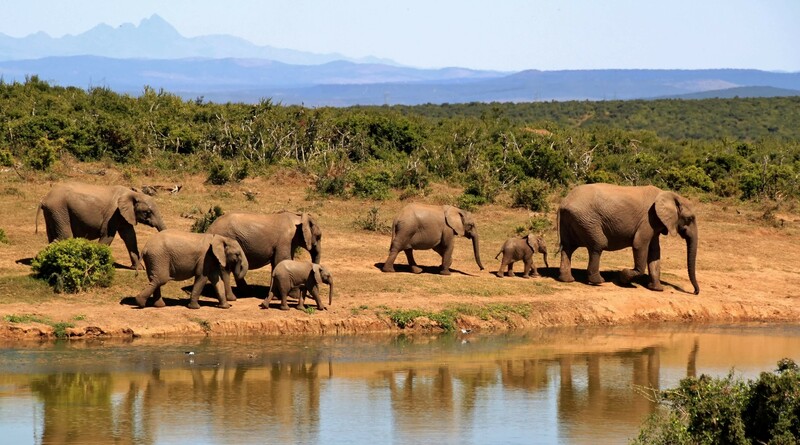 South Africa is well-known as one of the ultimate safari destinations, and with good reason. Inland, the infamous stretches of the Kruger National Park (one of many), brings you a taste of the wild. Home to the Big Five (lion, leopard, elephant, rhino & buffalo) and so much more, go prepared to get (relatively) up close and personal with some of the finest specimens to walk the earth. Whether it’s the sighting of a majestic lioness in her natural habitat or simply the chirping of an exotic bird high up in a tree, nothing can fill you with awe like the wonders of South Africa’s nature. The country’s ever-changing terrain provides ample opportunities for some sweat-infused adventure. Surf off the Eastern Coat; abseil Cape Town’s iconic flat-topped Table Mountain; rock climb in the Cederberg; bungee jump from the Garden Routes Bridge. If it’s something slightly less daring and more walk-friendly you’re after, there are countless hikes and treks across the country. The Amatola hiking trail and Fanie Botha trek are just two of many beautiful South African walks. Alternatively, take the action at a much slower pace with a glass of wine in the lush winelands of Stellenbosch or a day spent sun-tanning on the golden beaches of the Western Cape. History and culture are integral parts of a trip to South Africa. Museums such as the Apartheid Museum in Jo’Burg and the District Six Museum in Cape Town are necessary introductions into the country’s tumultuous past. The museum on Robben Island further conveys the political struggle and how far South Africa has come since the days of apartheid. In terms of visas, most nationalities don’t need one for South Africa unless the intended visit is over 90 days. Of course, it’s always best to double check regulations before you go. Once there, you will be using the local currency – the South African Rand. The Rand exchange rate fluctuates pretty regularly, and sometimes dramatically, so it’s best to ensure that you check rates often before the departing date to ensure you get the most for your money. Check our currency converter for live updates of exchange rates. Unlike most locations, South Africa is a year-round destination due to its diverse set of climates. The Cape has pleasant, dry weather in its summer months from November to February, whilst whale watching is best between July and November. The cooler winter months of May to September bring ample big game watching opportunities… So, why not spend the whole year?! As the size of France and Spain combined, needless to say, there is a staggering variety to do and see across South Africa. A one-of-a-kind experience and one that can cater to all.